The Combined Cadet Force (CCF) is a voluntary youth organisation in schools and colleges, in both the state and independent sector, sponsored and administered by the Ministry of Defence. The Cadet Expansion Programme (CEP) has been devisied by the government with the Department for Education and the Ministry of Defence. It aims to increase leadership opportunities in State Funded Schools. 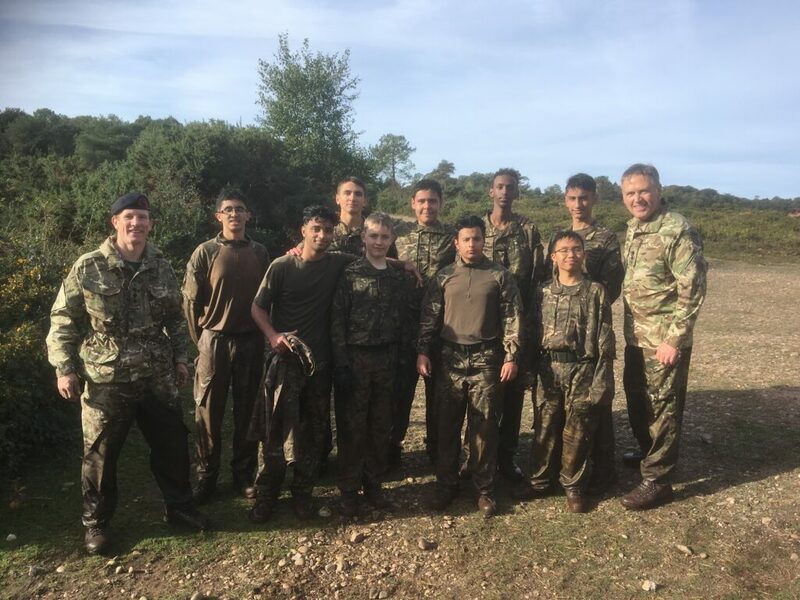 EBC is at the forefront of the CEP in London and is one of only two schools in London to have a Royal Marine CCF section, the other one being Harrow. If you are interested in finding out more see the Contingent Commander, Mr Mason, or the School Staff Instructor, Mr Jones who is in college on a Tuesday. The Combined Cadet Force (CCF) is a voluntary youth organisation in schools and colleges. Operating in both the state and independent sectors, it is sponsored and administered by the Ministry of Defence (MOD). CCF units, known as contingents, may comprise up to 4 sections: Royal Navy (RN), Royal Marines (RM), Army and Royal Air Force (RAF). The MOD sponsors the CCF and provides some financial aid, administered by the respective single Services which in our case is the Royal Navy. The CCF is for those people who are interesting in being leaders and developing their leadership potential, no matter what career they may enter into. Currently at EBC the CCF is open to Years 10, 11 and 12 but will open up to include Year 9 in the future. What types of activities can I get involved in? The focus is on developing leadership skills including communication, teamwork, personal organisation and self discipline. Other skills include map reading, fieldcraft, navigation, fitness, first aid and military knowledge. You will also be eligible to attend a wide variety of courses that are run including sailing, yachting and diving courses as well as attending the summer camps. You will be taught valuable skills such as life-saving and first aid, and how to teach/coach your peers to get the best out of them. You will be constantly learning how to develop your leadership style and what makes an effective leader. These skills are very transferable both to the worlds of work and university. You can add your CCF experience to your CV and/or UCAS personal statement. First, collect a letter of interest and application form from Mr. Mason. Complete the application and get the letter signed by your parents giving you permission to take part in the application process. Hand both the letter and application form in to Mr Mason. Following that and upon successful application you will be asked to complete a short presentation task to a small group including some adults. If you are successful in that you will be accepted into the next wave of training. Good luck and get those applications filled in!